Every year, 5 to 8 million homeless pets are cared for by our nation’s shelters, with a staggering 3 to 4 million of those pets euthanized, even though the overwhelming majority of them are considered to be healthy and adoptable. 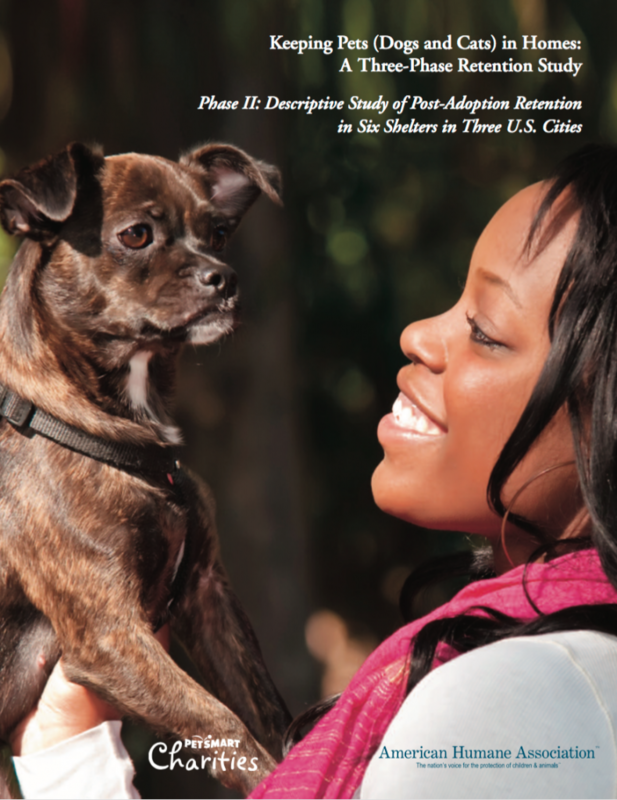 In 2012 American Humane’s Animal Welfare Research Institute embarked on a multi-phase study to better understand what is preventing people from adopting these animals and, more importantly, to learn the most effective strategies to ensure that newly adopted pets stay with their families, preventing relinquishment to shelters. Post-adoption return-to-shelter rates for dogs and cats have been reported to be between 7 percent and 20 percent for the first six months following adoption. These numbers do not include pets who were lost, died, or were given away instead of being returned to the shelter. Thus, there could be several hundred thousand to more than a million cats and dogs obtained from shelters in the United States who exit homes prematurely each year. This ongoing cycle of pet homelessness depletes already limited shelter resources when animals are returned, negatively affects industries and professions that serve our nation’s pets, adversely affects the human-animal bond among families and children, and puts a multitude of pets at risk for euthanasia. Though many shelters encourage adopted pets to be returned if the match does not work, adopters may choose avenues other than return to the shelter if they give up the new pet; thus the actual number of pets remaining in their homes six months after adoption is likely less than what is reported by animal shelters. If the majority of adopted pets who are not retained exit their new homes within the first six months following adoption as previously reported4, then the time immediately following adoption may offer a unique window for targeting intervention. For more than 136 years, American Humane has succeeded in protecting America’s children, pets, farm animals, and animal actors from cruelty, abuse, and neglect. Everything the organization does is rooted in science so that our actions, policies, and outreach may do the most good. In this ever-changing world, new threats to our most vulnerable constantly emerge, reinforcing the need for constant evaluation to protect our most precious treasures. Through projects such as this, American Humane and our Animal Welfare Research Institute hope to advance our knowledge of the challenges facing the wellness, welfare, and well-being of the creatures around us and to strengthen the remarkable physical and emotional bond between human beings and the animals that share and enrich our world.